The many personalities of Snoopy make and Peanuts collection more interesting. Expand your Peanuts gang with a vinyl figure of that lovable canine in fun colors. 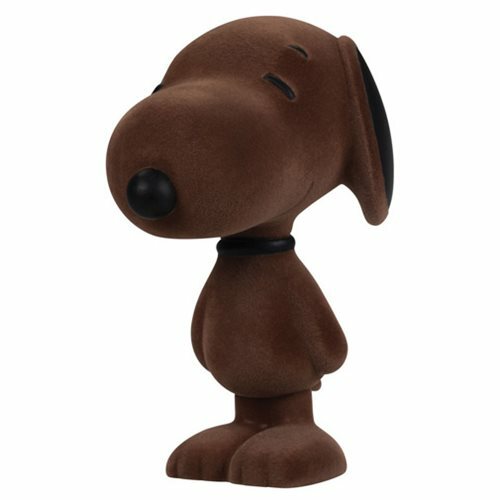 The Snoopy Flocked Cinnamon Vinyl Figure measures approximately 5 1/2-inches tall in a dark brown color scheme. Snoopy's eyes, ears, and other important features are left smooth and black; when combined with the flocked surface, this creates a contemporary, fashion-forward look. For the avid fan, or just those with fond memories of reading Peanuts comics in the papers, this fun and interestingly colored interpretation of Snoopy is sure to be enjoyable for everyone. Collect the other colors as well (sold separately)! Ages 13 and up.